When Gerber first started selling baby food in Africa, they used the same packaging as here in the USA–with the cute baby on the label. Later they found out that in Africa, companies routinely put pictures on the label of what is inside since most people cannot read. Since the beginning of time, God has been communicating with mankind. God’s communication has been clearly stated; (he doesn’t miscommunicate), but we have been having problem understanding it; God has sent messages regarding his plan for us; his plan for the world. However, the world is not paying attention; some are completely ignoring God’s message. The author of this letter reminds his recipients how God has been communicating in time past. God spoke through the prophets: they were God’s agents by which God communicated his plan to his people. The prophets were God’s voice to. “Thus says the LORD” (This is what the LORD says..) Even though God used human agents, the message was clear because it came directly from God. How did you know it was God and not a made-up story? If it came to pass; if it happened then you knew it was the LORD who said it. 2 Pet 1:20-21 20. knowing this first of all, that no prophecy of Scripture comes from someone’s own interpretation. 21. For no prophecy was ever produced by the will of man, but men spoke from God as they were carried along by the Holy Spirit. Most of the prophecies of the Old Testament have been fulfilled, there are some still pending which have to do with God’s kingdom, God’s rule. God spoke by the prophets and everything God said is certain. In these last day God has spoken to us by His Son. The author includes himself as one of those who received God’s ultimate communication. God decided not to send anyone else, he chose to come deliver the message himself. Jesus is God’s message to the world. Jesus was known as the Son of God during this earthly ministry. – The Son is heir of all things (everything belongs to him) He is the creator of all things. John 1:3 Through him all things were made; without him nothing was made. Col.1:16 by him all things were created, things in heaven and on earth, visible and invisible. He is before all things and in him all things hold together. – Jesus is the radiance of God’s glory, the exact replica of his being. (the exact imprint of his nature) This is why Jesus is called Immanuel, God with us. To see Jesus, was to see God himself. Jesus is God in the flesh (the Word made flesh). The image of the invisible God. When Jesus appear, God was visible. In the Old Testament people saw the glory of God, this too was Yeshua (Jesus). He sustains or hold all things together by his powerful word. – Jesus provided purification for sins. By his death on the cross. He was the Savior by whom people can be saved. He paid for our sins by dying on our place. – He is at the right hand of majesty in heaven: He is superior to the angels he created. In all things, Jesus has the supremacy, he is preeminent in all. These are just some facts about Jesus that the author of Hebrews highlights to prove to his readers that Jesus is supreme. 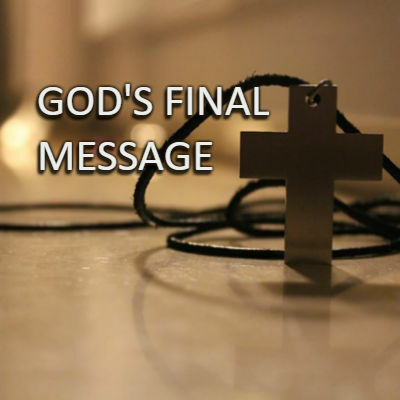 God has spoken to us by his final communication; Jesus is God’s last message to the world. God so loved the world that he gave his only Son, so that whoever believes in him will not perish but have everlasting life. Jesus is God’s final communication to the world. In Jesus, we have eternal life, in Jesus we have peace with God. God says, I love you this much that I sent you a savior. God has spoken to us through His Son. How are you going to respond to God’s final word? The next chapter in Hebrews tells us what we must do. Heb.2:1-3 We must pay more careful attention, therefore to what we have heard, so that we do not drift away. Pay much closer attention to what we have heard so that we don’t drift away from the message. This message announced by the messengers proved to be reliable. (v.2) , but every violation and disobedience received its just punishment. God has spoken, have you received his message? To ignore God’s message, communication is to welcome judgment upon yourself, punishment instead of blessing. God has spoken; he said what people must do in order to be saved. John 3:36 Whoever believes in the Son has eternal life, but whoever rejects the Son will not see life, but God’s judgment.